Ho Chi Minh City will do its utmost to foster relations between Vietnam and Peru as well as between the city and the South American country, especially in the economy and trade, said a municipal senior official. 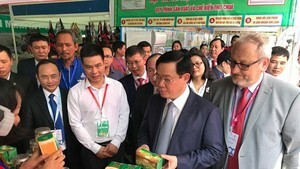 During a reception for Peruvian Ambassador to Vietnam Carlos Berninzon in the city on June 9, Chairman of the municipal People’s Committee Le Hoang Quan hailed the efforts made by the Peruvian diplomat over the past year in promoting the relationship between the two countries. For his part, the ambassador expressed his impression with achievements Vietnam and HCM City in particular have made in recent years.